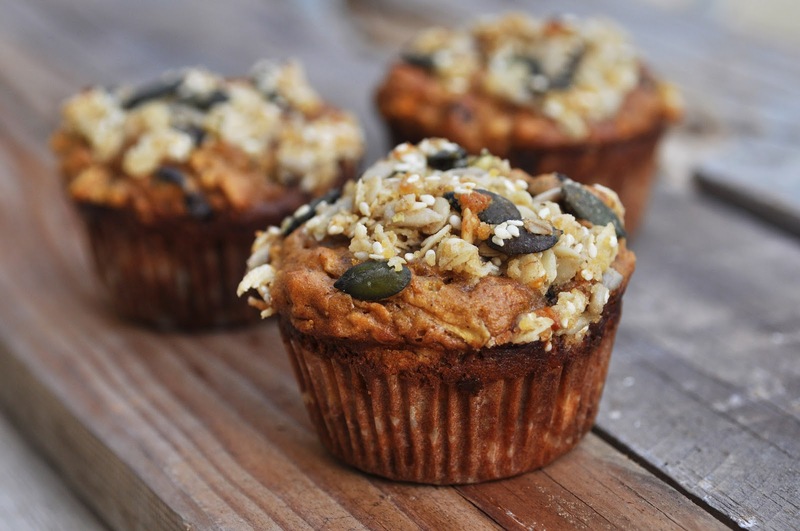 This muffin has got everything that a healthy breakfast calls for: wholesome flours, vegetables, fruit, dried fruit, nuts, seeds, yogurt and some honey. It can't get much better than that. They are extremely moist and intense in flavor. Honestly, to me the ultimate Number One of all muffins ever. Preheat the oven to 175C/375F. Line or grease muffins tins. In a medium bowl, sift together oats, flour, baking soda, ginger, nutmeg, cinnamon and salt. Add wet ingredients to dry ingredients and stir until just combined. Stir in the carrots, apples, and raisins. In another mixing bowl, combine sugar, flour and butter. Rub the butter into the flour and sugar mixture until you get a crumbly texture. Add nuts and seeds. Then add water, oil and honey. Fill the muffin batter in the muffin tray cups. Top each one with a generous amount of the topping mixture. Bake for 20-25 minutes. Let cool completely on a rack.